Has your relationship not only lost the spark that it once had, but is slowly rotting away like an old weed? Do you find yourself fighting and arguing with your now almost "insignificant" other over the most trivial and senseless things? Do you secretly wish that you could meet the person of your dreams and remain happy and in love forever? If you can directly relate to the all of the above, then you have come to the right place. But before I go any further, realize that you are not alone. All across the world, people are experiencing and harnessing these feelings within themselves. And as a result, their relationships with their partners are becoming more and more toxic each day. This is no way to live. Relationships are meant to nurture the soul, help you to grow and magnify the human experience. For many people, including you, the human experience is becoming negatively affected by your relationships and that can be frustrating, stressful, sad and worrisome. The good news is that it doesn't have to be that way. If you really want to, you can reinvent, rejuvenate and reignite the flame that once burned so brightly in your relationship. How do I know this? 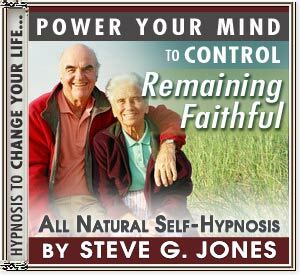 Because I have been helping people do it for the past 25 years of my life using the power of hypnotic influence. And now, I've taken my covert methods and transformed them into a simple, easy to apply, step by step proven formula that you can use to access your mind on a subconscious level to create immense positive change in your relationship. The Truth About Your Current Relationship - Discover what really makes up your current relationship and uncover the problems so you can rectify them and move on. Creative And Effective Conflict Resolution - There are many ways to resolve conflict ; many of which you may not know about until now. The Five Essential Elements That Make Up A Happy Marriage - Without these components, your relationship is destined to fail. Discover what they are so you can position your partnership for success. The Secret To Keeping It Alive - Once your relationship is rejuvenated, the key is to keep the flame burning. I’ll show exactly how to do just that and more. When I designed this program, I designed it with one simple goal: to help people save their relationships and find happiness by uniting hearts with their better half. Isn’t that what we all deserve? Well now you can trade in your days of conflict, resentment and misery for a new lease on your love life. And best of all, you can do it for less than the price of a cheap dinner with your soul mate. For just $27.97, you can own the resource that will bring you the joy you once had with your partner. 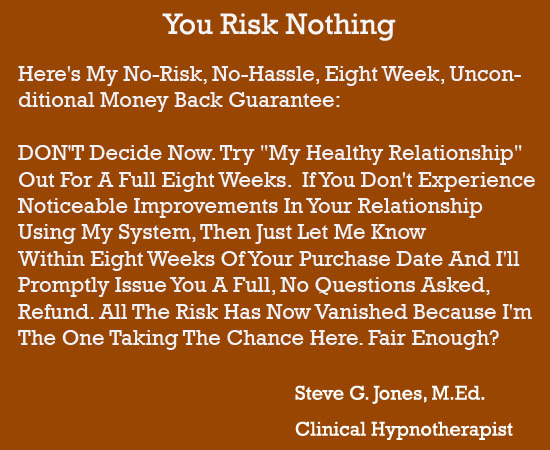 Learn how to successfully stay faithful to your partner with hypnotherapy!